1961 Ohio Safety Inspection Sticker - $20.00 : Bob Hoyts Classic Inspection Stickers, Add a Final Touch to your Restoration! This 1961 Ohio sticker was carefully restored both front and back keeping true in color and size to the original. It has our patented "Peel and Stick" format which allows you to place it on the inside of your windshield. For an additional $10. we can remove the serial number and add your license okate number. 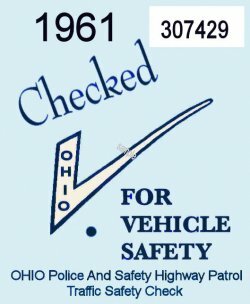 Ohio had a statewide inspection program starting in 1967. There were safety inspections dating back to 1946. These sticker were used by car dealers and garages that did repairs after cars pulled over with defective equipment. Many states including Indiana, New York and California also used this type of program before they officially opened inspection stations.